Truth by Kbaig: Suspicious End of Indian Terrorist "Sarabjeet Singh"! Suspicious End of Indian Terrorist "Sarabjeet Singh"! Astonishingly the singers of AMAN KI ASHA are silent from last few months. There might be only two reasons either AMAN KI ASHA propagandists have realized that Pakistani nation is not ready to be deceived by their propaganda that Pakistan should ignore all disputes with India or they are silent for some secret purpose or happening which India can exploit to further deteriorate the diplomatic relations; no matter whatever is the reason of silence of AMAN KI ASHA brand actors the attack over Indian terrorist Sarabjeet Singh at Kot Lakhpat Prison on 26 April is much suspicious. 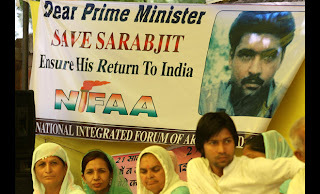 Sarabjeet Singh was arrested in 1990 when he was returning to India through Wahga after conducting successful remote control bomb blasts in Pakistan. During investigations he confessed to have conducted several bomb blasts in Lahore, Faisalabad and other cities (his confession was also telecasted on TV), so he was sentenced for death by the court under the charges of killing several innocent Pakistanis. After several appeals in 2008 when Sarabjeet was to be executed, his death penalty was not forgiven but temporarily delayed by the President of Pakistan Mr Asif Ali Zardari. After this human rights activists from both of the countries and Western funded NGOs started pressurizing Pakistani govt. 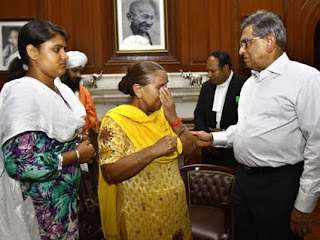 forgive and release Sarabjeet Singh (as the persons killed by this terrorist were not human beings or those in Guantanamo bay and other US prisons are not human in the eyes of these so-called human rights activists). Moreover, Pakistan govt. was pressurized by them to end death penalty in Pakistan in the name of human rights and different Western envoys with the help of some politicians in power also pressurized govt. however, the family of Sarabjeet Singh was invited to visit Pakistan, of course they were guests, the meetings between civil society, media personnel and the family of Indian terrorist were arranged in order to create a soft corner in the public of Pakistan for convicted terrorist. Not only in Pakistan but in India as well rallies and protests were staged in order to pressurize govt. to release murderer of dozens of innocent Pakistanis, many Indian actors famous in Pakistan met with the sister of Sarabjeet Singh and assured her their solidarity for the struggle to get Indian terrorist released from Pakistan. How much Sarabjeet Singh was important for India and links between Indian terrorist could be imagined from the meeting between Indian Foreign Minister S.M. Krishna and Dilbeer Kaur sister of Sarabjeet Singh before she left for Pakistan. If one may remember suddenly a news was broke on Pakistani media that Sarabjeet Singh has been released and Indian media started celebrating their victory while Pakistani media was telecasting the reaction of Pakistani public. 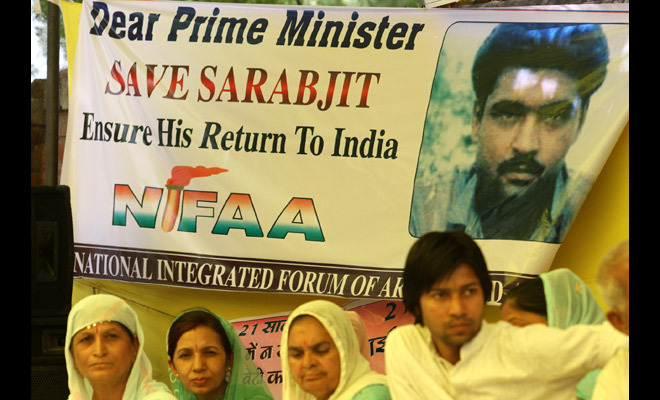 However next day it was clarified that it was Sarajeet Singh not Sarabjeet Singh who was released thus Pakistani public were calmed because the heirs of those killed in the bomb blasts by Sarabjeet Singh were demanding justice and execution of Sarabjeet Singh. Moreover many Pakistanis who have ever met any Pakistani prisoner released from India were aware that Pakistanis were trashed into Indian prisons merely on suspicion where they were badly tortured that most of became insane while remaining died waiting for medical aid. For all these reasons Pakistani public had no mercy for Indian terrorist Sarabjeet Singh but in spite of this hatred India succeeded in getting many of its terrorists released from Pakistani prisoner under cover of AMAN KI ASHA specially Kashmir Singh Sarjeet and Gopal Daas but Pakistanis were not ready to accept the release of terrorist Sarabjeet Singh. Astonishingly at such times of tension Indian terrorists were safe in Pakistani prisons, neither prison security nor inmates had tortured them or insulted them in any way. So what about a murderous attack? How Indian terrorist (prisoners) are treated in Pakistani prisons Sarajeet Singh and Gopaal Daas are evidence of this where on returning to India they did not complain about any abuse in Pakistan moreover their health was also an evidence as well. When Indian prisoners were not abused in Pakistani prisons than why did the incident of attack over Sarabjeet Singh leading to his death in Pakistani prison took place? In the contradicting reports of newspapers in one it was said that Sarabjeet Singh was attacked when he was brought out of special cell for walk by two inmates who attacked him with bricks, blades and cartons (tin made) of Ghee. As a result he (Sarabjeet) became unconscious while two prison guards were also present when this scuffle took place. According to other news report during discussion he had quarrel with two inmates named as Mudassir and Amir who attacked him and he was shifted to Jinnah Hospital by Prison administration in a critical situation, where doctors shifted him on artificial respiration and struggled to save his life. On the other hand the unusual quick issuance of visas to family of Sarabjeet Singh and granting permission to India High Commission to see Sarabjeet Singh by Punjab govt. creates many suspicions. Not only this in the way a protest camp was established outside Indian Parliament for release for Sarabjeet Singh and in the way banners and posters were printed it seems they had been informed in advance about attack over Sarabjeet Singh. In the way the visas were issued to the family of Sarabjeet Singh on emergency basis even the officials of the foreign ministry were also stunned there is no such example in the history of foreign ministry. Has this happened in the result of a deal or just for their inclinations towards India this would be decided by time but there is no doubt that there is abundance of such characters in Pakistan who are ready to do anything at the beck and call of India in order to assure their payments from enemy, one may quote hundreds of such examples. Here the confessing statements given by inmates attacking Sarabjeet Singh in front of investigation Magistrate and the satisfaction on the faces of Sarabjeet Singh’s family when they arrived Pakistan also raises many questions. Inmates who attacked Sarabjeet Singh are also on the waiting list to be executed and they have given statement that they have killed Sarabjeet Singh because he is an agent of enemy and murderer of hundreds of innocent Pakistanis, it seems as someone has made them give such statement. On the other hand the expressions of the family of the Sarabjeet Singh did not show that he was in critical condition while doctors of Jinnah Hospital were repeating that in spite of being on ventilator next 24 hours were much important for Sarabjeet Singh. In this regard a photo of Sarabjeet was also released in order to win the sympathies of the society in which he has shown as laying on the bed in Comma while doctors have already said that he has died physically. Although few analysts claimed that whole story of attack over Sarabjeet to his transfer in Jinnah Hospital was a drama staged to transfer him out of Pakistan because the reaction of Indian govt. and Foreign Ministry was much different from the news published in Indian Media. On the Indian media the anti-Pakistan rallies and protests were telecasted while in the statements of Indian govt. in spite of usual threats and violent statements expressions were gratuitous and thanking however as soon as the death of Indian terrorist was announced the behavior of Indian govt. got suddenly changed. Now a campaign of propaganda against Pakistan on Indian media and threats to Pakistan are expected Indian reaction. But sister of Indian terrorist has alleged caretaker govt. of Punjab for murder of her brother now one can make as much inquiries and investigations as one likes that how bricks and iron rods were brought into the special cell with which Indian terrorist was attacked. Although the death of Indian terrorist would satisfy the legal heirs of those killed in bomb blasts who were demanding execution of Sarabjeet Singh according to the death punishments awarded to him but lets see how India exploits the murder of her terrorist against Pakistan and what were the hidden purposes behind such attack?? ?